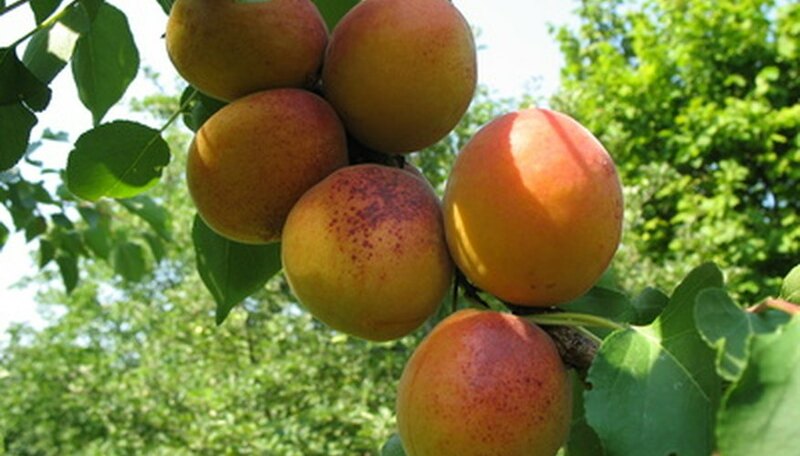 Apricot trees, along with other stone fruit trees, benefit from annual applications of a complete fertilizer in the spring to boost fruit production and maintain healthy wood and foliage growth. Apricot trees should be fertilized beginning in their second year of life and each year thereafter, according to the University of Arizona. Organic or chemical fertilizers both work and either fast release, slow release or a combination of the two are acceptable options. Fertilize your apricot tree once each year in the early to mid-spring before the buds appear and begin to swell. Choose a complete fertilizer with a guaranteed analysis of 10-15-10 or a fertilizer product designed specifically for stone fruit trees. Calculate the proper amount of fertilizer by measuring the diameter of the trunk or by using the tree's age, if you know it. Consult the product label for dosing directions for the size and age of your apricot tree, but do not exceed 1 1/2 pounds of fertilizer for every inch in trunk diameter or for every year of the tree's age. Don a pair of garden gloves and cast the fertilizer over the entire root zone of the tree starting roughly a foot out from the trunk and extending to at least a foot past the outer drip line of the canopy. Nestle the fertilizer into the top few inches of soil gently with a rake, being careful not to go too deep where you disturb the more shallow roots of the tree. Water in the fertilizer and surrounding soil well, drenching the soil down to a depth of at least 2 feet.